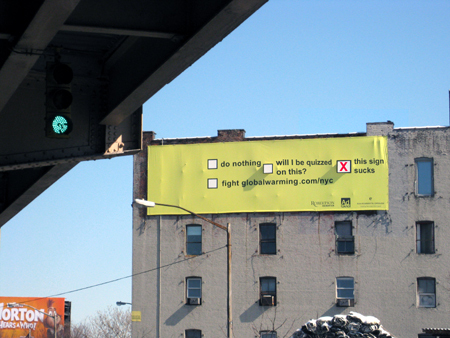 I encountered this nugget of Ad Council hilarity on Lorimer Street yesterday. 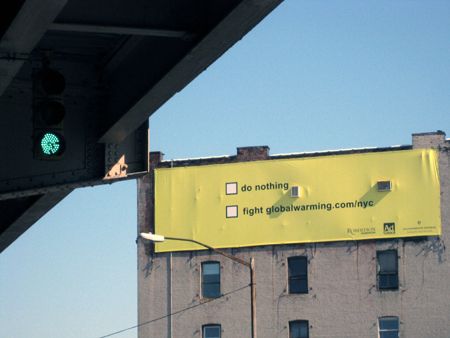 I’m guessing the point of this advert is to inform users of the BQE (automobile drivers all) that global warming is BAD. Indeed auto emissions are bad. But smothering a building in advertecture strikes me as being somewhat worse. for this reason I felt a few modifications were in order. You know, I am getting pretty darn good at Photoshop if I may so myself.